The fotdella was an instrument invented and constructed by Jesse "The Lone Cat" Fuller, an American one-man-band musician, who needed an accompaniment instrument beyond the usual high-hat (foot-operated cymbal) or bass drum favored by street musicians. Dreaming it up in the early 1950s, while lying in bed, he set about constructing a foot-operated bass instrument. It ended up as a large upright box with a rounded top, vaguely shaped like the top of a double bass, with a short neck on top. Six bass strings were attached to the neck and stretched over the body. 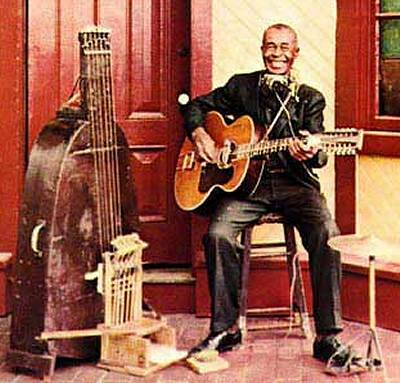 To play the instrument, there was a homemade set of foot pedals, each one bringing a padded hammer to strike a string when depressed, like the action of a piano. With these six bass notes, Fuller could accompany himself on the 12-string guitar in several keys. The name "fotdella" was given to the instrument by Fuller's wife, who took to calling it a "foot-diller" (as in the then-current expression, "killer-diller", meaning exceedingly good); later, it became shortened to just fotdella.